Animal healthcare has become a focus area for many pharmaceutical companies in past decade. The particular market has become even more important because of greater instances of animal disease outbreaks coupled with large scale factory farming that requires high quality animal feed additives, vaccines as well as hygiene management products. The global animal healthcare market is estimated to value at US$ 32,081.5 million in 2014 and expected to reach 43,032.1 million by 2020, reflecting a CAGR of 5.1% during forecast period. The animal healthcare market is expected to show major growth in feed additives segment due to rising demand of meat, milk and egg worldwide. The market has been accessed by product type as feed additive, pharmaceuticals and vaccines for both companion/pet and production/farm animals. Feed additive segment was valued at US$ 14,998.3 million in 2014 with 46.8% market share. Currently, feed additives account for the largest market and is expected to gain further market share to maintain its dominant position through the forecast period. Pharmaceuticals accounted for the second largest market share with 37.0% market share in 2014. Vaccines segment was valued at US$ 5,204.6 Mn in 2014 and is expected to reach US$ 6,901.4 Mn by 2020 reflecting a CAGR of 4.9% between 2015 and 2020. By animal type, production animal accounts for the major market share with 65.1% in 2014. It was valued at US$ 20,871.7 Mn in 2014 and is expected to reach US$ 27,791.6 Mn by 2020. In contrast, companion animal segment accounted for 34.9% market share in terms of revenue, but is expected to grow faster than the production animal segment for various pharmaceuticals and vaccines. The companion animal segment was valued at US$ 11,209.8 Mn in 2014 and is projected to reach US$ 15,240.5 Mn by 2020. Geographically, the market is segmented into five regions namely North America, Latin America, Europe, Asia Pacific and Middle East & Africa (MEA). Europe and North America together constituted more than 63% of the market share in 2014 which is expected to come down to 61.4% by 2020. Major growth is expected to come from Asia Pacific, Latin America, MEA and some East European countries. Asia Pacific which is one of the highest producer of animal meat in the world is expected to consume highest amount of feed additive followed by North America. North America and Western Europe is a potential market for companion animal products whether it be pharmaceuticals or vaccines. Consumers demand for natural products and food processor’s demand for transparent labelling would drive the demand of Animal Healthcare categories. Furthermore, development in micro-encapsulation techniques and packaging innovation would give thrust to carotenoid market. Government regulations are highly supportive towards the use of natural products, thus there are numerous supply side and demand side drivers fuelling the expansion of Animal Healthcare market globally. Over the last decade, various independent entities have emerged as standalone animal healthcare companies to fulfill the ever-increasing demand for feed additives, veterinary drugs, and vaccines. Animal healthcare market has also seen some very important mergers and acquisitions to acquire expertise in developing new drugs/active pharmaceutical ingredients. The market is also highly potential for branded generic drugs in as most of the blockbuster drugs are now off-patent. Greater investment in R&D to develop new drugs would fetch animal healthcare companies’ greater profits in the coming 15-20 years. 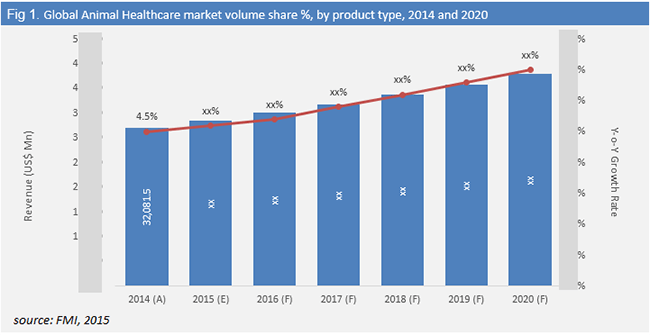 Some of the market leaders across the globe are in the pharmaceutical & vaccine segment of animal healthcare market includes Zoetis, Inc. (Pfizer), Merck & Co., Inc. (Intervet), Eli Lilly and Company (Elanco/Novartis), Bayer Healthcare AG, Ceva Santé Animale, Virbac S.A, Vetoquinol SA, Boehringer Ingelheim GmbH, Nutreco N.V. and Sanofi S.A. (MERIAL Limited). Major animal feed additive manufacturers are Cargill Inc. (Provimi), ADM Alliance Nutrition, Koninklijke DSM N.V and Evonik Industries AG among others. 515,107 total articles and counting.